As I’ve mentioned many times before, my area has just gotten its own Dress for Success local affiliate and I am a proud volunteer! We have an online auction going on right now with some great items up for grabs… check it out! Success Suits Her Gift Bags and Free Tickets to the Southern Women’s Show are up for grabs! Our auction is being held in conjunction with this year’s Southern Women’s Show April 24-26 at the North Carolina State Fairgrounds. Make a donation of at least $25 prior to the show and you will receive admission to the show, as well as a “Success Suits Her” gift bag in appreciation of your support. Visit our booth (613/615) to receive your bag filled with great products (including over $50 of Burt’s Bees personal care products) and discount coupons for valuable savings. 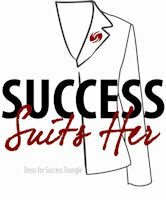 Dress for Success – NC Triangle Affiliate will have a fashion show at the Southern Women’s Show featuring clients wearing Dress for Success clothing. Sue Stock (N&O) and Sonya Williams (Tarheel Talk) will share wardrobe stretching tips, reveal the hottest bags from Beijo and most importantly, celebrate each woman’s success. Please be there and support these great women on this special day.Thanks for reading – please feel free to share/repost/etc. !